Healthy Home Investigation with Dr. Oz! 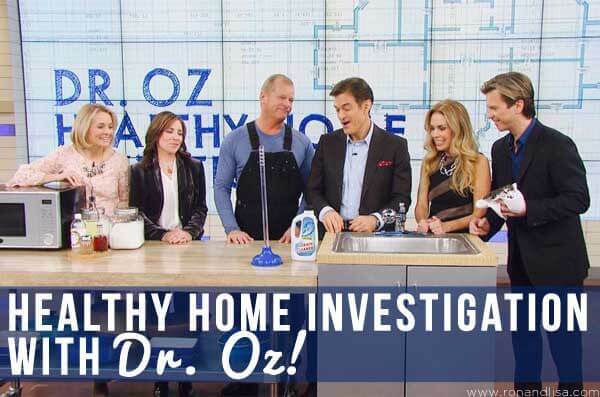 From saving crickets and eating (nontoxic) pest control to Ron scrubbing ovens and a special guest hiding in the shower, our Healthy Home Investigation show on the Dr. Oz show is full of surprises! Watch below as Ron and I take you on a healthy home journey to discover the best (and worst) do-it-yourself mold test kits, a few nontoxic methods of pest control (including the ABC’s of safe ant removal) and do-it-yourself , safe, chemical-free cleaning hacks that will have you breathing a sigh of relief! Want to learn more? Heed the advice of Dr. Oz and take our FREE Healthy Home Challenge now! We hope you enjoyed these fun and easy tips to keep you and your family safe and free from toxic exposures! If you’d like to see more of the show, head over the The Dr. Oz website to watch now. Did you have an ah-ha moment or favorite tip? Let us know in the comments below and as always – be green & be healthy! I am grateful to you guys for helping me out and offering great support! You both are gems and believe me, the information you provided worked really well for me. Wonderful Alison! Music to our ears and we are thrilled you benefited from the show and practical information. We hope it helps you live healthier. Wonderful tips! real fun and lovely way to brief people about healthy life. Dr. OZ is exceptional in talent and so knowledgeable. Agreed Christian! He’s the real deal! It can’t get better than the ‘A B C’ formula, I applied it and it worked! Thanks for the information. Yes, it really does work. You just need a little patience for the bait trap – about 10 days or so – to be fully effective. I’m glad I watched these videos. However, it’s hard for me to locate where the ants are coming from. How do I go about it? Patience :) You just need to follow the trail (they leave a trail of pheromones). Follow where they enter/exit. Great one here! I love this video. Thank you very much. You guys have a very practical approach towards these common issues. Keep on sharing inexpensive solutions. Thanks Lisa! Yes, easy and affordable solutions – that’s our goal!! This article improved my knowledge about really healthy homes. By the way, I used Mold Kit and am impressed with the results so far. Thanks ! !